NBC 6's Jamie Guirola is live in Broward County as officials worked around the clock to meet the Thursday recount deadline. Meanwhile, Palm Beach County faced machine issues and Miami-Dade County reports having finished the initial process of the recount. In the race to finish recounting hundreds of thousands of votes before Thursday’s 3 p.m. deadline, election officials in Broward County continue their process in hopes of not missing that deadline. 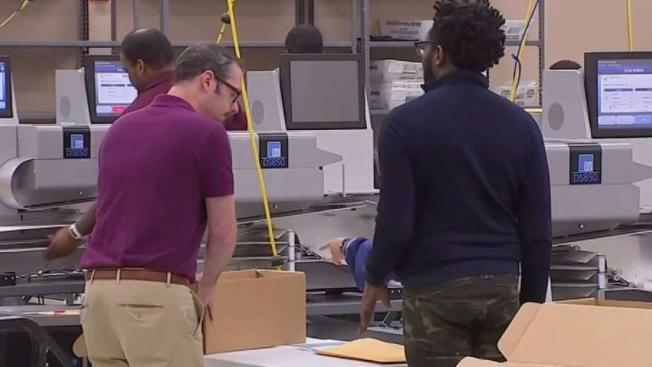 Workers continued through Tuesday night and into Wednesday morning after starting to separate and process thousands of ballots an hour through tabulation machines for a second time. Director of Planning and Development Joe D'Alessandro told NBC 6 "we will finish on time," insisting the recount should take around 15 hours to complete. Broward Supervisor of Elections Brenda Snipes also told reporters Tuesday that they would meet the deadline. "We will complete the recount. There's never been a deadline that we have missed," Snipes said. Snipes also addressed the rash of criticism against her, including from Florida Republican Gov. Jeb Bush, who appointed her in 2003 and on Monday tweeted that she should be removed from office. Snipes said "it is time to move on" but said she hasn't finalized a decision and needs to speak with her family. "I think I have served the purpose that I came here for, which was to provide a credible election product for our voters," Snipes said. Officials initially said they might not start the recount until Wednesday, but then said they would begin counting early votes Tuesday. Mail-in votes will be sorted later. Across the state, Florida's election recount is chugging along as more irregularities have been uncovered and a judge asked the warring sides to "ramp down the rhetoric," saying it erodes public confidence in the election for Senate and governor. Miami-Dade County elections officials said late Tuesday night that while they finished the initial counting of their ballots, they still need to conduct a second process of quality assurance. Meanwhile, in Palm Beach County, Elections Supervisor Susan Bucher said the county's 11-year-old tallying machines aren't fast enough to complete the recount by Thursday. WPTV reported machines were malfunctioning Tuesday night at the tabulation center in Riviera Beach and that mechanics were on site. Bucher told WPTV they ultimately have to recount hundreds of thousands of early voting tallies. "We’re trying to move forward to reorganize the ballots so that we can rerun them again," Bucher said. "We don’t have a lot of assurances, as you know, the machines are old and they started overheating, so as a result, the tally types are not reconciling properly." The county is doing the Senate race first and will then do the governor's race. If the deadline is not met in a race, the results it reported Saturday will stand. In Broward County, additional sheriff's deputies were sent to guard ballots and voting machines, even though a judge said no Republican who has publicly alleged fraud in the county's process — a list that includes President Donald Trump and Gov. Rick Scott — has presented any evidence to law enforcement. White House spokeswoman Mercedes Schlapp said Tuesday the president "obviously has his opinion" on the recount. Trump on Monday tweeted that "An honest vote count is no longer possible" in Florida, without elaborating, and said "new ballots showed up out of nowhere." It was unclear what he was referring to. He demanded that the election night results — which showed the Republicans leading based upon incomplete ballot counts — be used to determine the winner. "It's been incredibly frustrating to watch. You have a 12,000-vote gap and the other candidate refuses to concede," Schlapp said, referring to Scott's opponent, incumbent Democratic Sen. Bill Nelson. "So I think at this point that it's going to go through the process of the manual recount and the machine recount and we'll see what happens, but we're confident that Rick Scott will be the next senator of Florida." Nelson and a Democratic campaign committee continued to file lawsuits Tuesday, with one asking a federal judge to set aside looming deadlines for machine and hand recounts of ballots to give all counties time to complete recounts. An attorney for Snipes described layers of security including keycard and password access to rooms where ballots are kept, secured by deputies and monitored by security cameras and representatives of both campaigns and parties.